Project obstacles and solutions: The homeowner wanted to create more space in his driveway for an RV and upgrade the look of all of the concrete hardscapes. Decker Concrete designed a stamped, colored concrete walkway that circled the house and lined the driveway with a cut stone pattern. 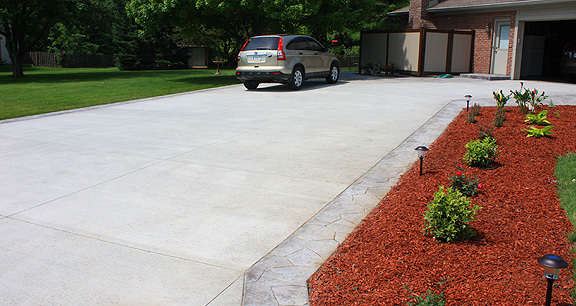 The main body of the driveway was finished with a broomed finish. Decker used a shake on Sage color and accented it with a Platinum release. The homeowner had taken notice of a neighbor’s driveway that had been pock marked with popouts and scaling. This kind of damage can occur due to poor finishing techniques, such as overworking concrete or a mix design that has aggregates that are too hard. Overworking the concrete happens many times when the mix is too stiff and hard to move. If the coarse aggregates do not segregate well or the surface paste is worn down due to excessive troweling, popouts can occur. Decker turned to IMI for a quality concrete mix that would be easy to work with and was mixed with the appropriate coarse aggregates. They selected a 4,000 psi gravel mix. Since the driveway was to support the weight of the RV, it was poured at a depth of six inches, while the walkways were poured at a depth of four inches. IMI delivered a total of 45 yards of 4000 psi concrete for this project. For more information on colored concrete from IMI, click here. For more information on concrete for homes from IMI, click here.